This sheet offers the modeller 6 decal options. 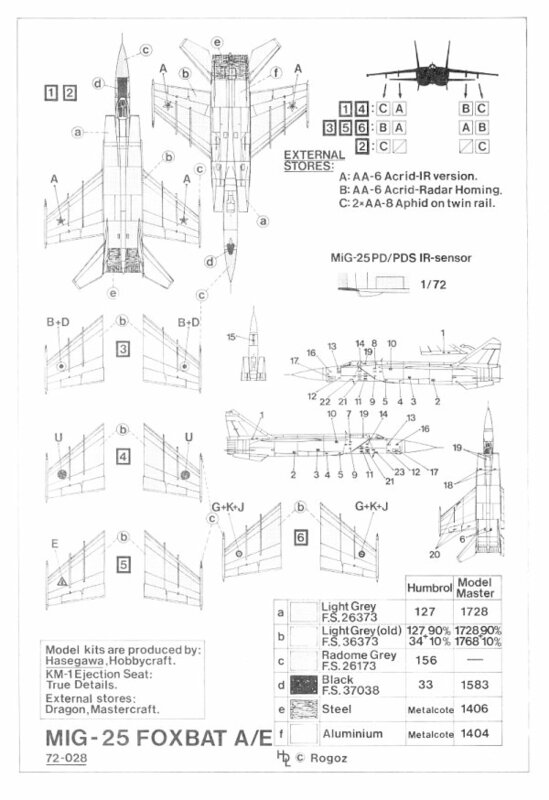 There are enough stencils included to do one of the 6 planes featured on this sheet, although with additional stencils it would be possible to do more but not all of the planes on this sheet. The first decal option is for a MiG-25 PD Foxbat E of the Soviet Air Force in the winter of 1983. The paint scheme of this plane is Light Grey (old) (FS 36373) on top and bottom.....with some steel on the undersides of the engines. The nose cone of this plane is Radome Grey (FS 26173). 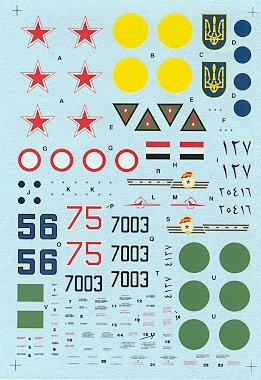 The second decal options is for a MiG-25 PD Foxbat E of the Soviet Air Force at Tula A.B. in 1990. The paint scheme of this plane is Light Grey (old) (FS 36373) on top and bottom.....with some steel on the undersides of the engines. The nose cone of this plane is Radome Grey (FS 26173). The third decal option is for the same MiG-25 PD Foxbat E except it is now with the 146th Fighter Avn. Rgt., of the Ukrainian Air Force at Vasil'kiv A.B. in 1993. The paint scheme of this plane is Light Grey (old) (FS 36373) on top and bottom.....with some steel on the undersides of the engines. The nose cone of this plane is Radome Grey (FS 26173). The fourth decal option is for a MiG-25 PDS Foxbat E of the Libyan Air Force at Okba Ben Nafi A.B. in 1986. The paint scheme of this plane is Light Grey (old) (FS 36373) on top and bottom.....with some steel on the undersides of the engines. The nose cone of this plane is Radome Grey (FS 26173). 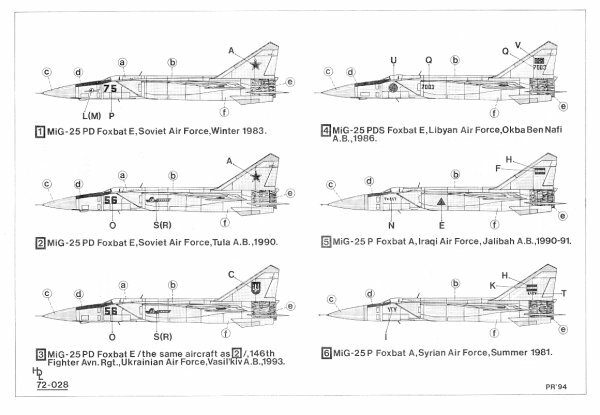 The fifth decal option is for a MiG-25 P Foxbat A of the Iraqi Air Force at Jalibah A.B. in 1990-91. The paint scheme of this plane is Light Grey (old) (FS 36373) on top and bottom.....with some steel on the undersides of the engines. The nose cone of this plane is Radome Grey (FS 26173).  The sixth decal option is for a MiG-25 P Foxbat A of the Syrian Air Force in the summer of 1981. The paint scheme of this plane is Light Grey (old) (FS 36373) on top and bottom.....with some steel on the undersides of the engines. The nose cone of this plane is Radome Grey (FS 26173). These decals are clearly printed in register and appear very thin, so they should conform beautifully. The small stencil writing is clear although much too small to be readable on the 1/72 sample I have before me.